Cover and blend on medium speed about 3 minutes, stopping occasionally to scrape sides, until smooth. Experiment with different herbs and nuts, such as cilantro and cashews, or arugula and walnuts. Fact: anything that’s tossed, topped or dipped in aioli is automatically delicious. 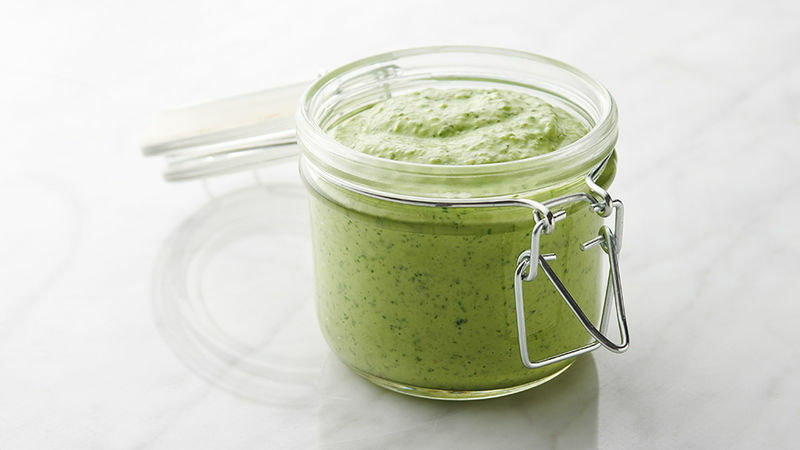 Aioli is a creamy mayo-based condiment that can be used for pasta, sandwiches, burgers, or even as a dip. The uses for this condiment are endless; this particular aioli recipe pairs well with chicken or fresh veggies, or it makes for an excellent cream-based pasta sauce. If you want to lighten up an aoili recipe, you could use Greek yogurt, too. Experiment with seasonings, herbs and nuts to customize based on your tastes, dietary needs and preferences. This is DIY dressing at its finest—once you try a few, you’ll never buy the bottle at the store ever again.